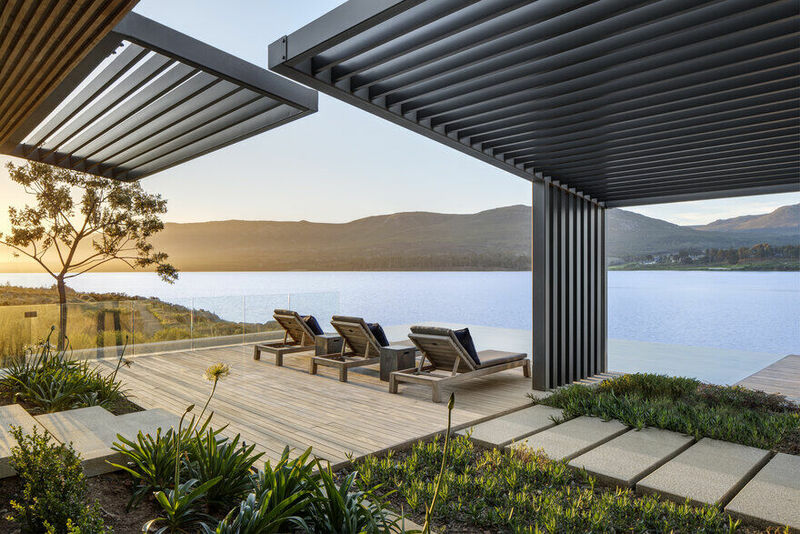 Nature pervades the Benguela Cove House –the seamless flow of internal floors and ceilings out into external living spaces is mirrored by the fynbos planting which stalks the edges of the internal envelope, enfolds the terraces and decks and seeps into the garden courtyard. 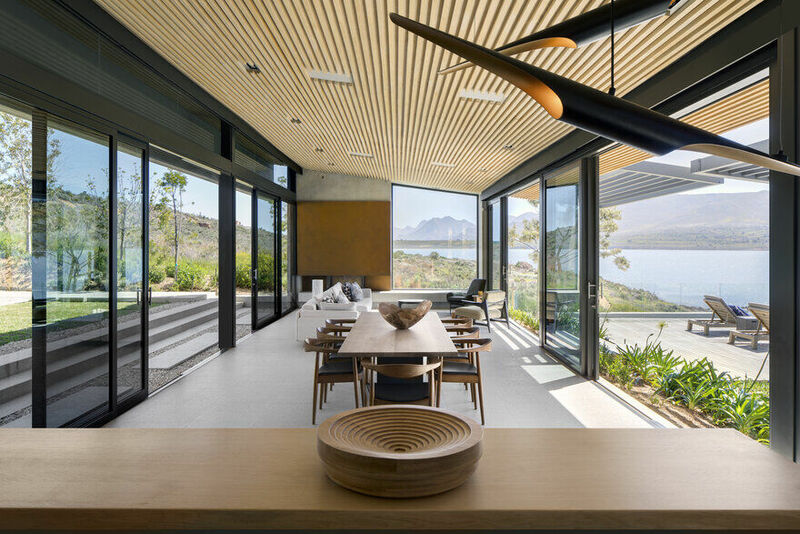 The setting for this house within Benguela Cove Lagoon Wine Estate, on the Botrivier Lagoon south-east of Cape Town is spectacular – a slope of indigenous fynbos vegetation runs into the broad waters of a tidal estuary bordered by mountains. 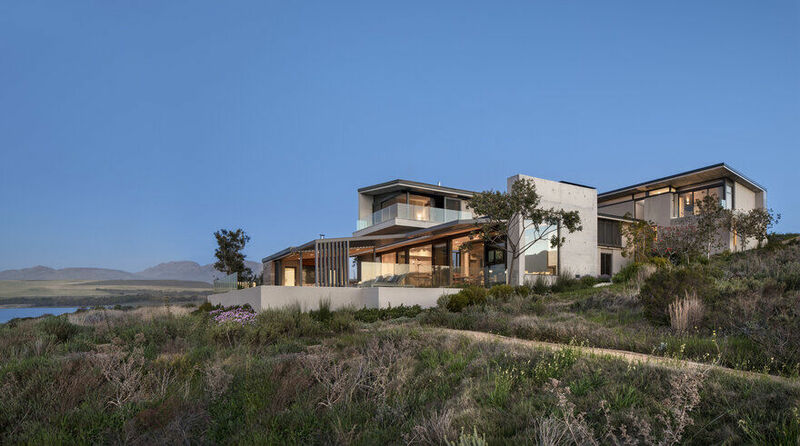 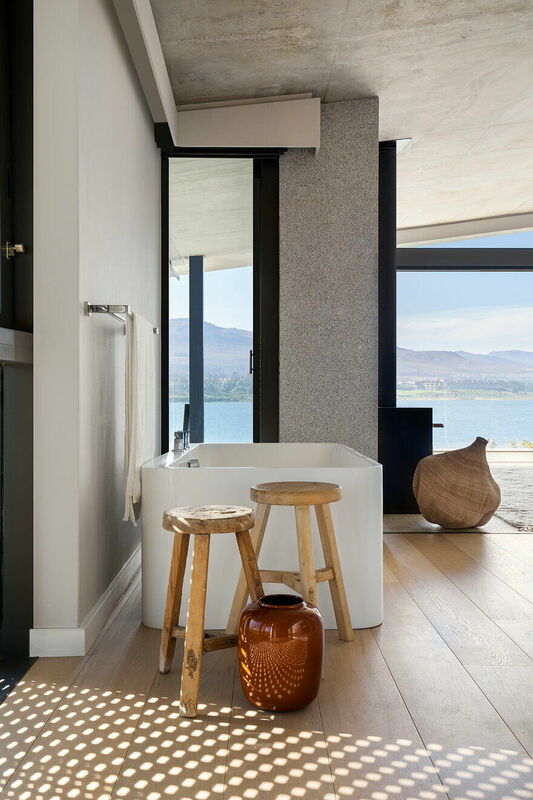 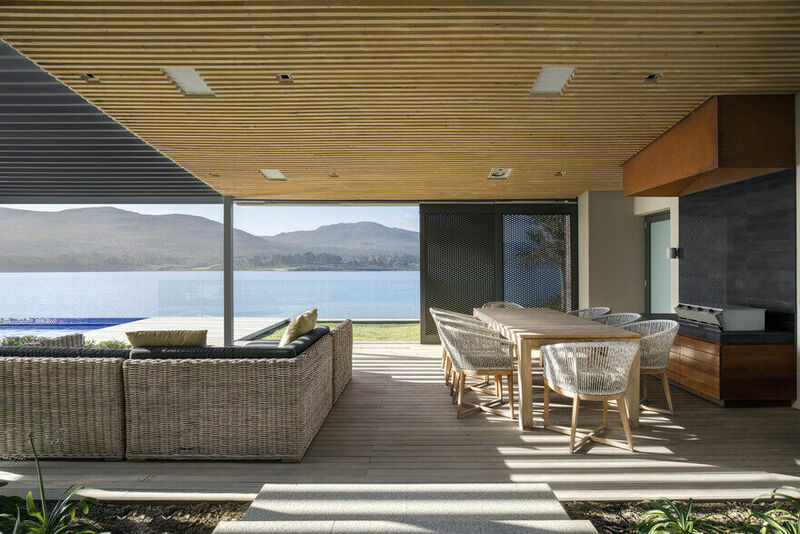 The considered architectural design by SAOTA and Interiors by ARRCC of this holiday house in negotiate the inherent paradox of such exposure to nature – how to shackle the extreme elements – sun, salt, rain and, in particular, high winds – whilst allowing the exceptional natural beauty of the site to pervade every space. 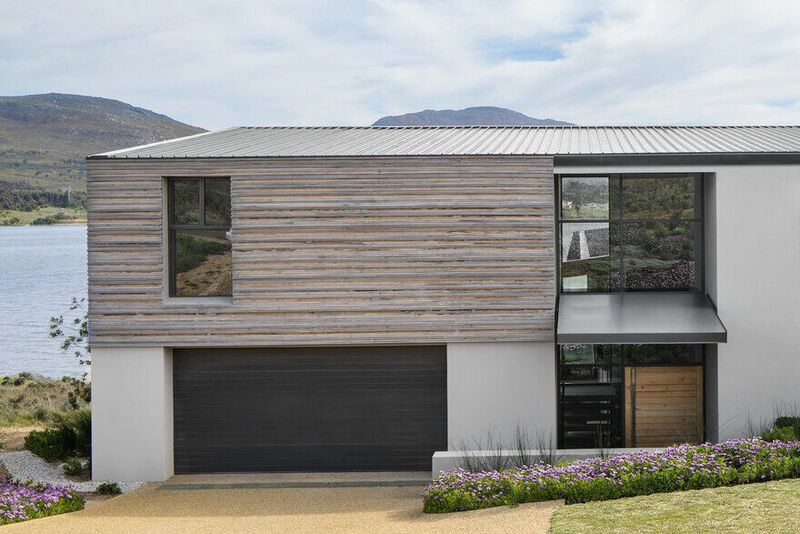 The owner’s vision for a comfortable retreat for his children coupled with liveable outdoor spaces for entertaining was developed into a “C” shaped plan whose wings serve to maximise outlook, frame views and create a large sheltered courtyard. 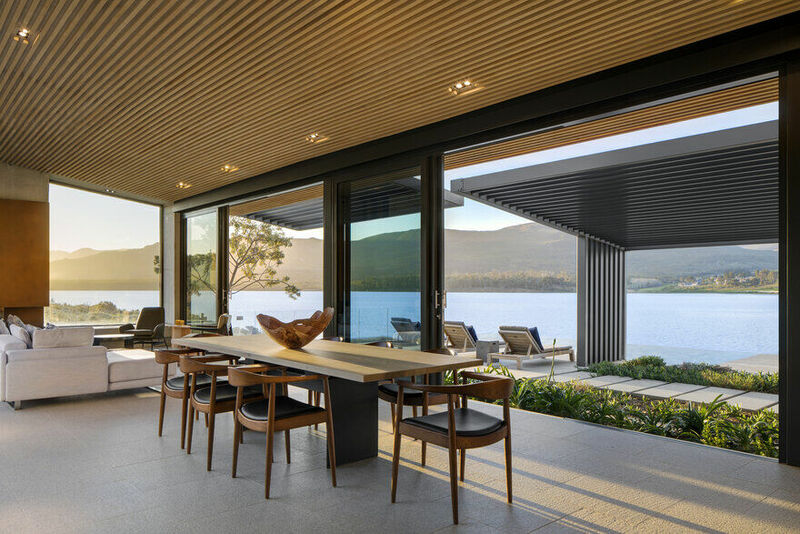 This distinctive sheltering shape is again expressed in the wrapped floor-wall-roof profile of the three wings which, assembled together one above the other, track the site as it slopes towards the water. 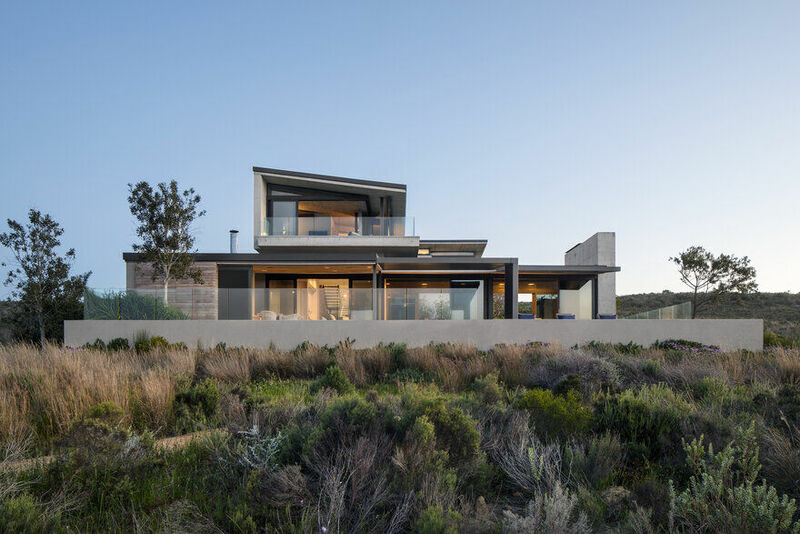 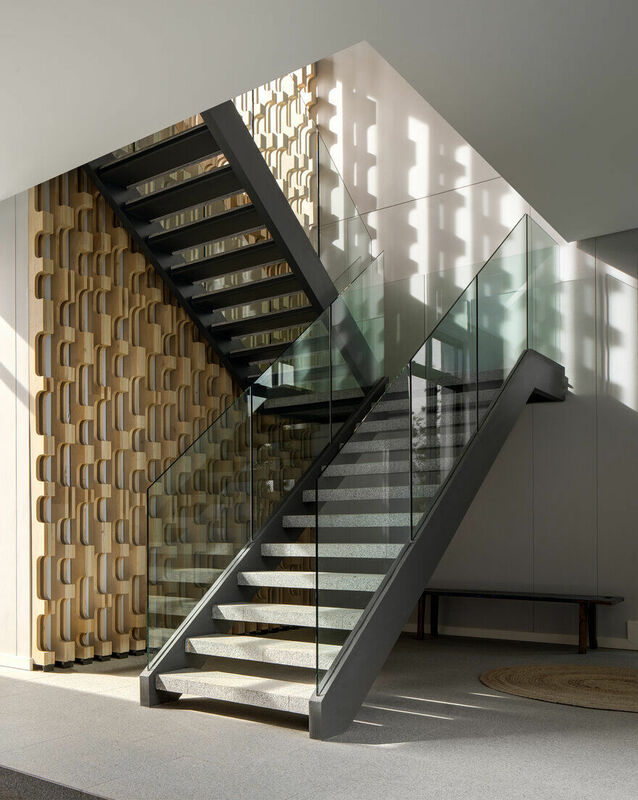 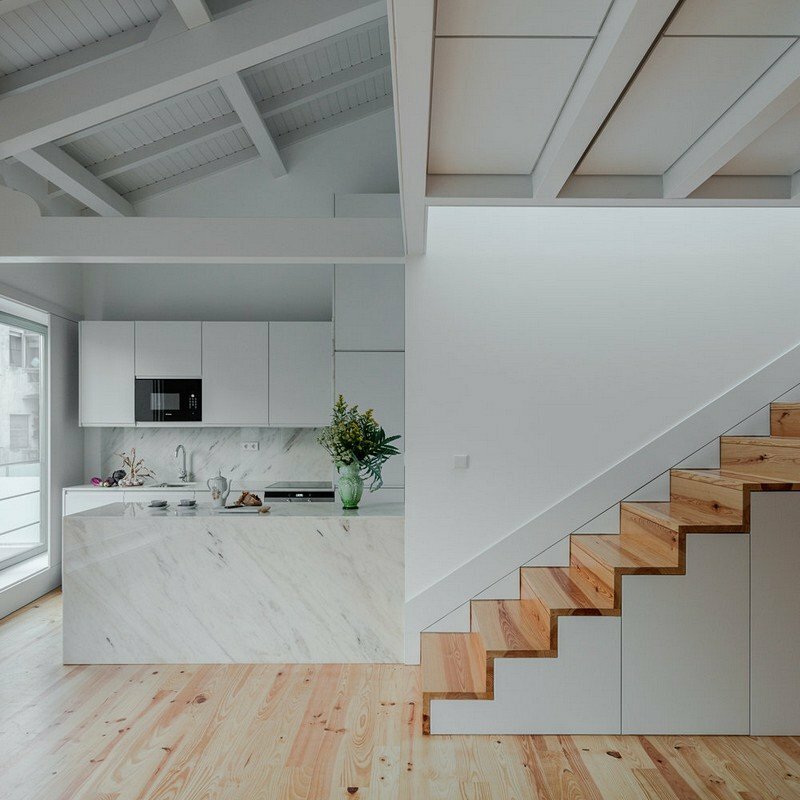 The interior design of Benguela Cove House by ARRCC captures the minimalist sensibility of the architecture. 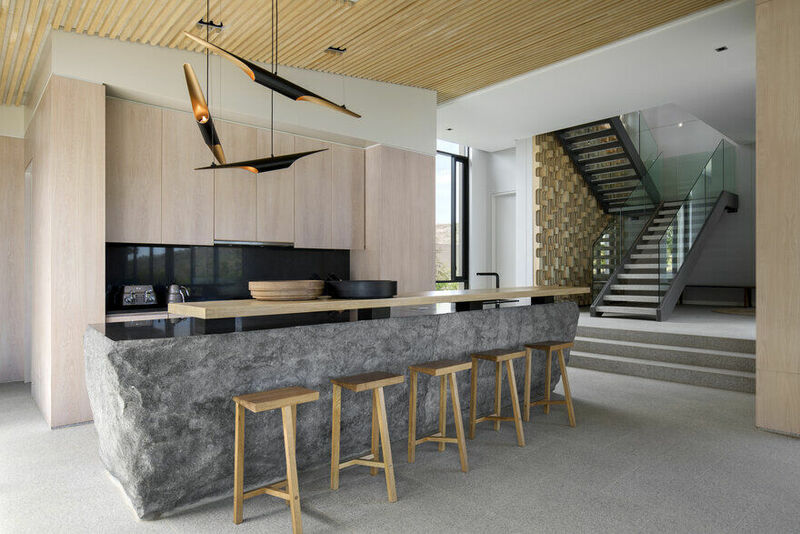 Occasional elements contrast raw materials with more refined details – the kitchen island- formed from rough solid blocks of granite – is highly polished on its counter “Through the use of rich materials and an edited colour pallette, the decor is seamlessly integrated optimising the sense of space” says Mark Rielly, ARRCC Director. 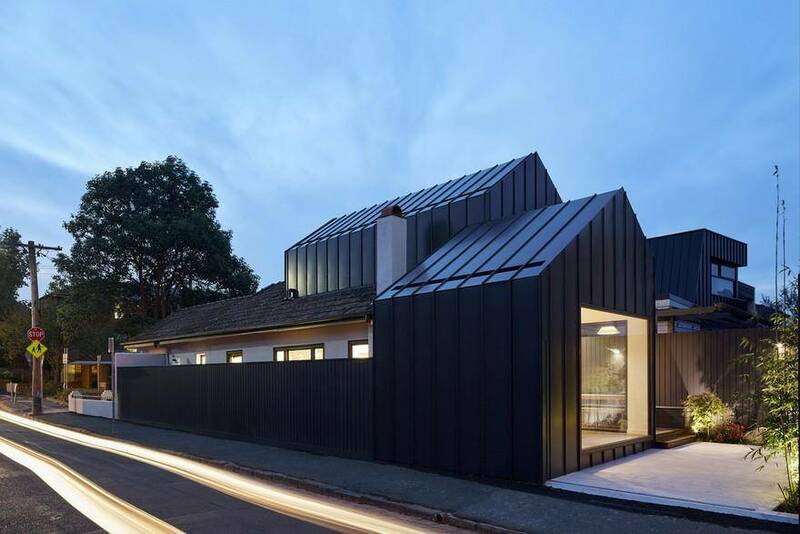 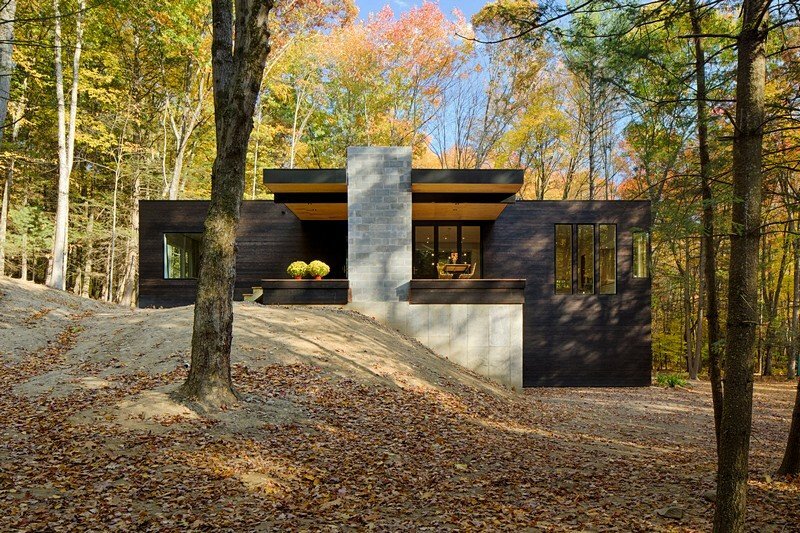 The flues are clad in carefully pre-weathered Cor-Ten steel. 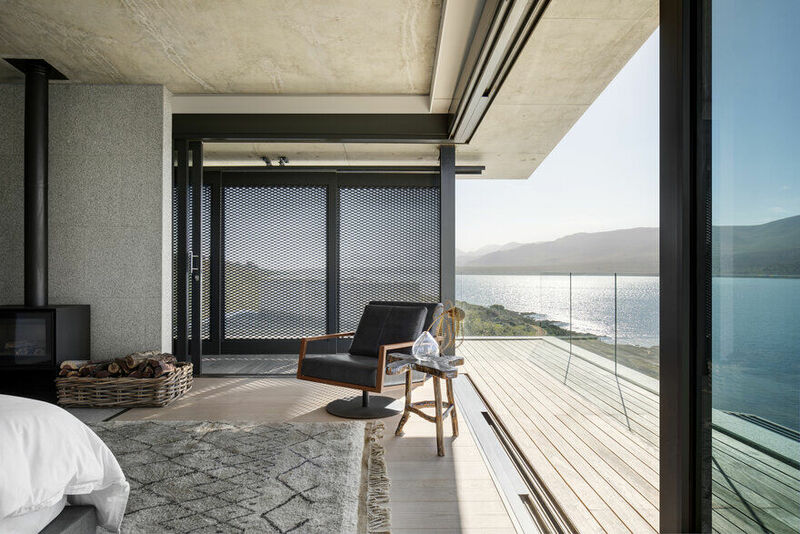 Throughout the Benguela Cove House loose furnishings selected by ARRCC, generally sourced from local manufacturer OKHA, provide a warm and luxurious counterpoint to the architecture. 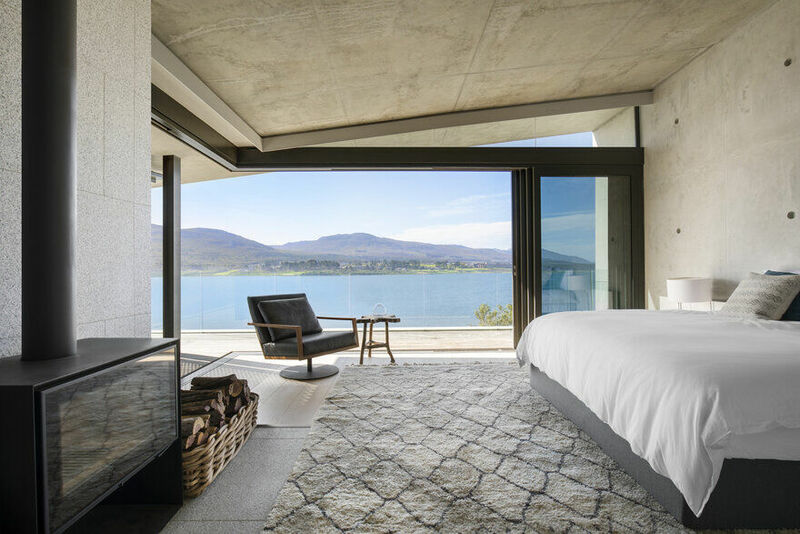 OKHA’s signature fine wool and bamboo silk Diamond Rug which takes its inspiration from geometry and rock formations complement the granite floors of the living room. 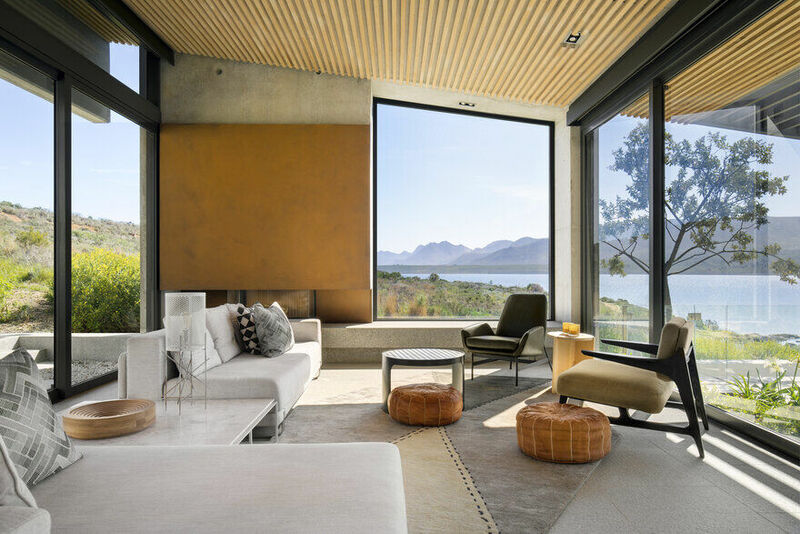 Seating is provided by an impromptu collection of OKHA’s luxurious L-shaped Jada sofa, solid oak frame Miles armchair and Nicci armchair in olive-green leather finish. 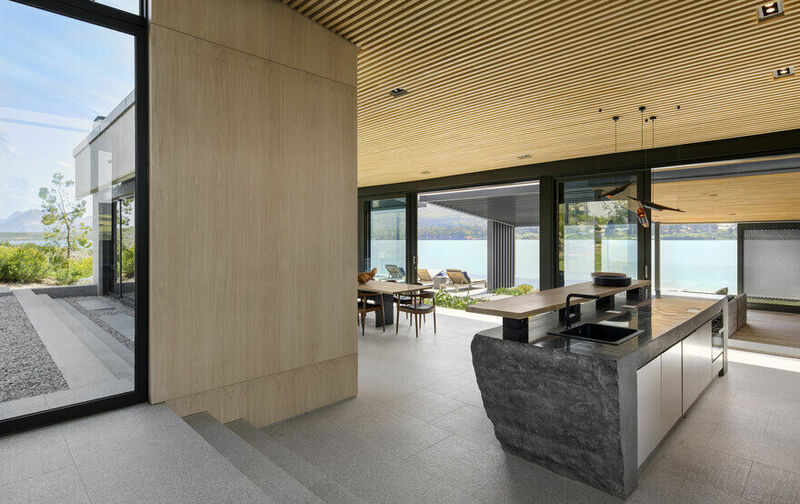 To anchor the collection the Capri Coffee table in Volakas White marble was chosen to resonate with the geological surrounds. 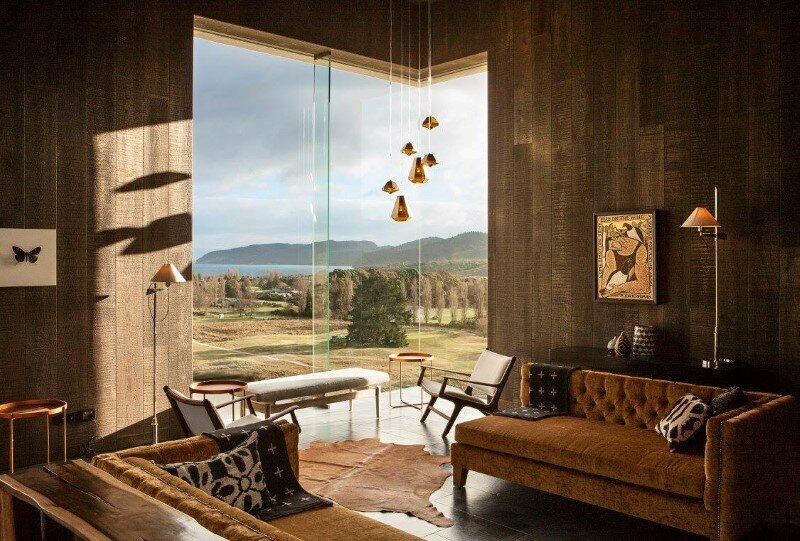 Occasional leather poufs add a casual flair to the layout.